Public green spaces fulfil multiple crucial functions within a city or municipality. For instance, public green spaces help shape the identity of a given city while also providing attractive public areas - an essential factor in creating a positive climate for living and working. Greenery in the public sphere includes all trees, parks, public gardens and verges that are owned and/or maintained by the city or municipality. Attractive public green spaces are possible only when the care and maintenance of that public greenery is properly organised. 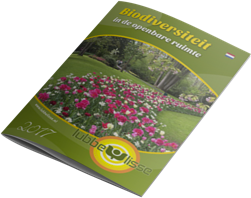 Lubbe & Sons can help you plant and care for (i.e. maintain) your public green spaces. We have over 120 years of experience and our specialised machinery enables us to work carefully and effectively. We draft a maintenance plan before beginning, so that you always know what to expect. We deliver good results at an acceptable price. The costs of maintaining a green space depend on the type of greenery used. We're happy to visit the site with you beforehand in order to explore the possibilities. Feel free to contact us any time for advice on maintaining public greenery.